The Fang of Haynekhtnamet is a literal fang which was carved into a blade and fashioned into a small dagger. It is named after Haynekhtnamet, a mythical wamasu from the Shadowfen region of Black Marsh. Scholars believe that Haynekhtnamet is not actually a single creature but a series of wamasu, and as such it's possible that there are multiple Fangs. The most famous Fang of Haynekhtnamet was created by a score of Nords who fought Haynekhtnamet for seven days and nights before finally bringing the creature down, believing it to be a dragon. One of the survivors took a fang as a trophy, and it was later carved into a dagger which mysteriously houses some of the beast's magical properties. The dagger grants the wielder the ability to shock an opponent, and has been seen occasionally by traveling heroes throughout history. This particular Fang came into the possession of the Sixth House during the late Third Era. It was reportedly recovered by the Nerevarine and sold to the Mournhold Museum of Artifacts in 3E 427. There is evidence of a second Fang of Haynekhtnamet, also known as the Swamp Raider's Fang of Haynekhtnamet, which was taken from a wamasu in 2E 582. 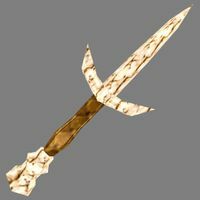 Fashioned in an Argonian style, this jagged blade was heavily befouled and would cause disease in anyone it struck. When worn with similarly-crafted gear, the blade was also known to magically fortify the wielder's weapon damage and stamina, and could even increase the potency of poison and disease enchantments when the wielder expended magicka. Feyfolken is a supposed artifact of the Daedric Prince Clavicus Vile, which is only known from a series of historical fiction books. It is a quill enchanted by a daedra by the name of Feyfolken serving Clavicus Vile at the request of Thaurbad, a sage for the Temple of Auri-El. It transfigures the writing of the user into scripture of unparalleled quality.The trade-off of wielding such an item is that the quill manipulates the thoughts of its beholder. 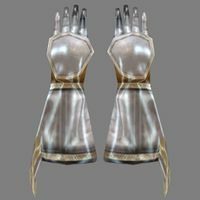 The Fists of Randagulf were worn by Randagulf, one of the mightiest warriors from Skyrim in Tamrielic history. He finally lost the gloves, and his life, when High King Harald conquered Skyrim circa 1E 143-1E 221. King Harald respected this great hero and took Randagulf's gauntlets for his own. After King Harald died, the gauntlets disappeared. The King claimed that the Fists granted the bearer added strength. 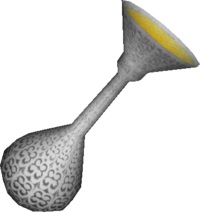 The Flask of Lillandril is a magical flask that absorbs and reflects magic of all kinds. Its anti-magic property also prevents mages from detecting its location. The flask was discovered around the year 1E 470 by a group of elves living in the Summerset Isle city of Lillandril. The elves spread news of their discovery, enough to make it an artifact of song and legend. It became the city's symbol and was displayed on their banners. The elves used the flask to perform favors for the barons of Summerset Isle by keeping in check the magical power of the Bosmer in Valenwood. One legend says that a stable boy defeated the High Wizard of Valenwood using only the flask. After some time, the elves who discovered the flask feared that Bosmer assassins would kill them, so they fled for Daggerfall, hoping to buy safety from the Direnni. The elves shipwrecked off the southern coast of Stros M'Kai, killing all of them according to legend, and the Flask of Lillandril was lost. The general location of the flask, however, was not lost. Sometime after the shipwreck, a map was created showing its location relative to a wayshrine to Leki in the town of Saintsport. The map was torn into four pieces; one of them was later inscribed on a ship model made of silver and another on the back of a Restless League insignia. Some think there was a survivor of the shipwreck who hid the flask on land and made the map. Additionally, ancient fragments of a manuscript called the Lagan Text contain references for a second map that clarifies the orientation of the first map. Into the late Second Era, treasure hunters from all over Tamriel searched for the flask to no avail. During its occupation of Stros M'Kai, the Third Empire also searched to some degree, possibly to dispel the magical defenses of the Summerset Isles and start an invasion. In 2E 864, Cyrus learned about the flask and was able to piece together the map showing its location. He discovered it contained within a chest buried in the sand not far west of Saintsport. With this flask, he was able to defeat the Sload necromancer N'Gasta by reflecting the spells cast at him. He gave it to Clavicus Vile in exchange for his sister's soul, but Vile took it as a present instead and required that he solve a riddle to win back the soul.